Makeup young woman putting lipstick wearing hair rollers getting ready for going out. 4k00:12Makeup young woman putting lipstick wearing hair rollers getting ready for going out. 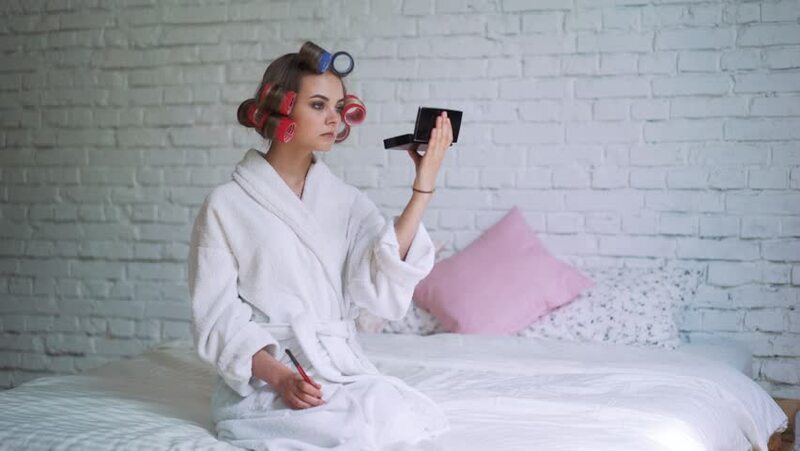 4k00:15Makeup young woman putting lipstick wearing hair rollers getting ready for going out. 4k00:18The girl after the shower sits in a Bathrobe with curlers and communicates on the phone. 4k00:19Portrait of handsome man using vr glasses in living room in slow motion. Shot with RED camera in 8K. Concept of innovation technology, lifestyle, entertainment. 4k00:14Putty. Putty wall. Wall in the new house. New made wall. Spatula and new wall. 4k00:17Teacher writing formulas on the chalk Board and explains the students the formula. 4k00:12the smell of detergent, the girl inhales the fragrance. 4k00:11girl with a face mask, inflates bubble gum.